Dry the shrimp off well with paper towels and add them to a bowl along with the Shaoxing and soy sauce. Mix well and then add the potato starch, mixing well to coat the shrimp evenly. To make the sauce, combine the dark soy sauce, 1 tablespoon shaoxing wine, black vinegar, doubanjiang, sugar, potato starch and black pepper in a small bowl and whisk to combine. Add the oil and peanuts to a frying pan and roast over high heat until the peanuts start to brown. Add the dried chilies and fry for a few more seconds or until the chilies become fragrant. Add the ginger and garlic and stir-fry until fragrant. Add the bell peppers and stir-fry until bright, but not fully cooked. Add the marinated shrimp and toss and stir-fry until they are cooked through. Add the sauce and toss until the sauce thickens and everything is evenly coated. 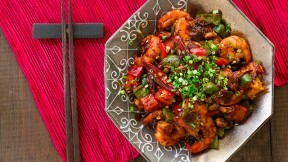 Plate the Kung Pao Shrimp and garnish with the chopped scallions.